1/8" check Dan River Gingham fabric. Now available in Light Blue, Red and Pink. Size 12" x 36". 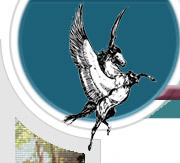 Price $3.00. 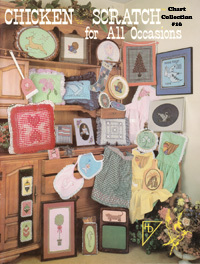 Includes:Butterflies, Rooster Weathervane, Quilt Square, Lace Ribbon, Elephant, Windmill, Tall Ship, Daisy Field, Rose, Cherries, Chicken on a Stick, Panda, Dogwood, Camellia, Morning Glory, Rainbow Row, Log Cabin, Squirrel, Train, Paper Dolls, Musket, Ducks in a Row, Mini Car, 18 Wheeler, Conch Shell, Sailboats, Small Windmill, Coffee Set, Telephone, Soda, Horn, Anchor, Pear, Dutch Girl, Mallard, Grapes, Apple, Hand Towel, Magnolia." 1/2 Yard 30 by 18 inches of Guildford Gingham fabric is a 14 count evenweave fabric that is 6 gingham squares to the inch. This is an ideal fabric for Chicken Scratch Embroidery. 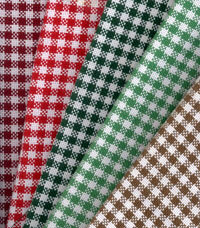 18 by 15 inches of Guildford Gingham fabric is a 14 count evenweave fabric that is 6 gingham squares to the inch. This is an ideal fabric for Chicken Scratch Embroidery. 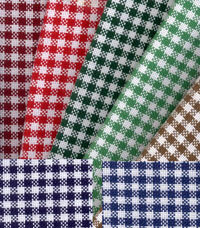 1 Yard 30 by 36 inches of Guildford Gingham fabric is a 14 count evenweave fabric that is 6 gingham squares to the inch. This is an ideal fabric for Chicken Scratch Embroidery.